The Atlanta Braves drafted Jason Heward with the 14th overall pick of the 2007 draft. He has all five tools that scouts look for and is showcasing them despite being significantly younger than the majority of his competition. He is a big left-handed hitter with a smooth swing and (for his age) good plate discipline. He has drawn comparisons to Ken Griffey Jr. which has people in the Braves organization ecstatic, although that may be a little too high. He's a great player, probably all-around my favorite prospect, but putting a tag on him like that could actually do more bad than good. He will spend most of the season in the Carolina League but since he is advanced in nearly every aspect of the game, he could actually rise quickly through the system despite only being 19-years-old. Heyward is in Advanced-A with the Myrtle Beach Pelicans of the Carolina League. He could be promoted in the second half if he continues his strong play. But at only 19-years-old, there is certainly no need to rush him. • First off, for those who don't know, tonight's MNGameNight podcast will feature a special guest. Twins starter Glen Perkins is scheduled to host the podcast along with Seth Stohs of Seth Speaks. It should be a great show and I highly recommend that everyone listen to it. • Tampa Bay took game one of the three game series this week, but the Twins battled back and took the last two games to take a two-one lead on the season series. Last night they beat the Rays 8-3. They will have a month break from one another before the two teams meet again, only next time they will be in Tropicana Field. • As Aaron Gleeman notes today, the Twins finished April at .500. Keep in mind, they played the entire month without All-Star catcher Joe Mauer. The team gets Mauer back on Friday which will be a huge boost from here on out. Mauer hit .400 on his rehab assignment with Class-A Ft. Myers, but more importantly had no setbacks. • Both Nick Nelson of Nick's Twins Blog and Parker Hageman of Over the Baggy are speaking out about Alexi Casilla's horrendous start. Although Brendan Harris may be considered by some to be a defensive liability, having Casilla (or Nick Punto for that matter) hit in the two-hole right now would be an even greater offensive liability. • In a recent post over at Minor League Ball, John Sickels talks about a few "Interesting College Hitters for 2009 Draft" where they list a former Twins-draftee Jared Mitchell. 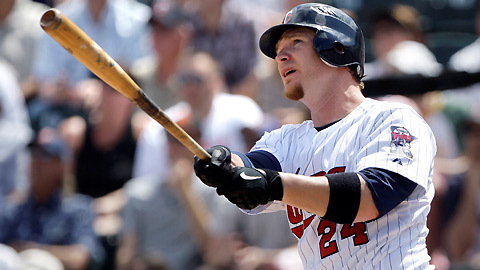 The Twins drafted Mitchell out of Westgate High School in the 10th round of the 2006 draft. Mitchell chose to play college football/baseball which could be a great decision as he's currently projected to be a 1st or 2nd round pick in the draft. He has outstanding speed and deceptive power. It will be interesting to see if the Twins have any interest in him, but with the high amount of outfielders the organization has drafted in the past few years, I don't see them taking an outfielder in the first few rounds this year. But anything is possible. Sickels does give a reason why Mitchell fell to the 10th round in the 2006 draft, and it's because he is playing football/baseball at LSU. Clubs could be shy on drafting him in fear that he'll again choose football over baseball. • The Low-A Beloit Snappers fell to the Dayton Dragons 2-1 yesterday. Brad Tippett lasted 5 1/3 innings and only gave up one run in the no-decision. The Snappers only collected two hits, one of which was a Evan Bigley double. • The High-A Ft. Myers Miracle beat the Palm Beach Cardinals 5-1 yesterday. Ben Revere and Marc Dolenc both had three hits apiece. Both also stole a base as well. Starter Michael McCardell had another impressive start, going 7 innings while only giving up one run. Santos Arias pitched two innings of relief to finish the game. • Double-A New Britain fell to the New Hampshire Fisher Cats 5-0 yesterday. The Rock Cats offense was anemic, collecting less than half as many hits as strikeouts. Ryan Mullins started and gave up four runs over 4 2/3 innings. • Triple-A Rochester out-dueled the Buffalo Bisons to a 1-0 win yesterday. Red Wings starter Kevin Mulvey had his best start of the season, lasting 5 2/3 innings while shutting out the Bison. He struck out seven while walking two in the no-decision. Mike Gosling picked up the win while Sean Henn picked up the save. Jason Pridie went 2-3 and scored the only run of the game. Dustin Martin drove him in. • Twins infield prospect Trevor Plouffe updated his blog, this time he took us through a typical day in the life of Trevor Plouffe. • Alright Hamilton has a funny post looking at some of the Twins players walk-up music for the 2009 season. The Twins fell behind in the series 0-1 before winning the next two games to take the season series lead against the Tampa Bay Rays. The Twins and Rays will conclude the series in a month, only this time we'll be playing in Tropicana Field instead of the Metrodome. Last night, the Twins had 12 hits, but most of the damage was done in the first inning when the Twins played small ball to take an early 4-0 lead. Denard Span, Brendan Harris and Justin Morneau hit one-two-three in the order and each had three hits apiece while coming around to score twice. Nick Blackburn had a great start, going seven innings while giving up eight hits, two runs, and a walk while striking out three. He now sits at 2-1 with a 4.02 ERA through five starts this season. The Twins have an off-day on Thursday before hosting the Kansas City Royals this weekend. The Royals are currently in a three-way tie with the Detroit Tigers and Chicago White Sox for first place in the A.L. Central. * Denard Span, Brendan Harris and Nick Blackburn all were candidates for this Game Ball. Cameron Maybin was drafted 10th overall by the Detroit Tigers in the 2005 draft. After spending two years in the system, including a stint in the Major Leagues, Maybin was traded with a slew of prospects in exchange for young slugger Miguel Cabrera and southpaw Dontrelle Willis. Maybin spent all but eight games of the 2008 season in Double-A where he should have been in his development. He had an impressive eight-game showing with the Marlins and was slatted to start the 2009 season in the Major Leagues, having never taken an at-bat in Triple-A. Maybin has great 5-tool potential and will only get better with experience. He has outstanding speed and should be able to steal plenty of bases while hitting for reasonably good power. To me, a good comparison would be Carlos Beltran for his potential. Maybin began the 2009 season with the Florida Marlins and unless he really plays poorly, he should be there from here on out. The Twins took one back from the Rays with a great 4-3 win tonight. Francisco Liriano delivered one of his best performances of the season, but Joe Nathan (out of everybody) couldn't preserve the win. Talk about some bad luck for Liriano who still sits at 0-4 on the season. Note: I should be having a "good" (OK, slightly better) post up on Friday, so make sure to check back then. Between now and then, expect a continuation of the MiLB Top 50 Prospect list (probably in the morning) as well as an update every night with a game ball. Here's a recap of tonight's game that was posted at BaseballDigest.com. 17 left on base...ouch! Hey everyone. This semester is quickly coming to a close and with that comes the unfortunate task of studying for finals. That obviously will effect the amount of content posted on the site over the next two weeks and I probably won't return to "regular posting" until the second week of May. Fortunately, the Twins feature many great Bloggers that should be posting over this time. If you're looking for good references, just check out the list of linked Twins Blogs on the left side of the page. And also, make sure to check out the Twins page at Baseball Digest. On most days, you'll be able to find Morning Doinks, an article and a game recap. If you've been out of the loop, make sure to go there for great Twins coverage. I will also vow to finish my Top 50 MiLB Prospect list over the next two weeks. I was doing a steady job of posting them, however school-related things have come up and hit me and it has unfortunately meant that posting that list has been inconsistent over the last couple of weeks. * This was a tough one. Not too often will a 2 home run night get passed up for a Game Ball, but Slowey was just unbelievable. Jason Kubel is clearly deserving though. I thought of giving both half of a Game Ball, which would have been a first, but to me Slowey was just slightly more deserving. The Atlanta Braves signed Feliz as a non-drafted free agent in 2005. At the trade deadline in 2007, the Texas Rangers made a blockbuster trade which moved All-Star first baseman Mark Teixeira to the Braves. In return, the Rangers got a few great prospects in return which have helped earn them honors as having the best Farm System in baseball (according to BaseballAmerica.com). Feliz was one of the players the Rangers acquired, and they're surely happy they did. He features quite possibly the best fastball in all of the minor leagues which reaches 100+ MPH and sits comfortably in the High-90's. He lacks a good breaking ball, but both his curveball and change-up are improving. Feliz needs to show better control, but he has the makings to be a dominate pitchers in the Major Leagues. Feliz is starting the season in Triple-A but many expect him to finish the season with the Texas Rangers. The St. Louis Cardinals selected Colby Rasmus with the 28th overall pick in the 2005 draft. Shortly after, teams started to regret the decision to pass on Rasmus. Rasmus was easy to sign despite having a full-ride offer from Auburn. Rasmus took the $1 million signing bonus and never looked back and three years later is a top ten prospect. Rasmus is a 5-tool prospect with good patience and great power. He hit only .277 in the minor leagues but will probably hit closer to .300 in the major leagues. He is still very young but has already shown the Cardinals that he's ready to handle a starting spot in the lineup. Rasmus started the season off with the Cardinals, but he'll have to earn a starting spot. Already fielding a great team and strong farm system, the Boston Red Sox almost struck gold when they drafted Pedro Alvarez in the 14th round of the 2005 draft. Alvarez spurned the Red Sox to play for Vanderbilt, and after three years it looks like it was the right decision. The Pittsburgh Pirates held the second pick of the 2008 draft and were gracious when Alvarez fell into their laps. The best overall player in the draft was a handful to sign, but it should pay dividends for a struggling Pirates organization. Alvarez has a good glove but an outstanding bat. In his three year collegiate career, Alvarez had an OPS of at least 1017 in each of his seasons. He signed late and didn't get his first taste of professional baseball until this year. He was placed in Advanced-A and is already off to a good start. He shouldn't take long to reach the Major Leagues and could be a reliable option as soon as next year. To say "the skies the limit" would be thinking conservatively with Alvarez. Alvarez started the season in the Carolina League but could end the season in the Major Leagues. ROCHESTER, MN., APR. 22, 2009 – Charter Communications and WFN: World Fishing Network, North America’s only 24-hour fishing lifestyle channel, will offer one lucky Minnesota angler and his or her favorite fishing buddy the opportunity to spend the day fishing with former MLB great Kent Hrbek in the “WFN HD/Charter Fishing with Hrbie” contest. WFN HD launched on Charter’s digital cable systems in Minnesota last year on Charter Sports View, digital channel 407. In addition to the two-hour fishing trip on one of the best lakes in Minnesota , the winner will also receive transportation to the fishing location, one-night hotel accommodation, lunch with the former slugger, exclusive WFN prize pack and the opportunity to appear in the production of one episode of Kent Hrken Outdoors. In addition, highlights from the event will be featured on a WFN show. The contest runs through May 15, 2009. To enter, anglers should visit www.WFN.TV/charter to complete an official entry form. Customers can contact Charter at 1-888-GETCHARTER for more information on subscribing to WFN. Hosted by the former MLB star and award winning journalist Eric Gislason, Kent Hrbek Outdoors prides itself on entertaining, non-traditional, personality-driven television at its best. Guests include newsmakers from the worlds of sports, business, entertainment, politics, media, and even everyday people – all woven together with trademark storytelling and stunning high-definition photojournalism. Hrbek, who was born and raised in Minnesota , is a true Minnesota sports legend. His 13-year MLB career (1981-94) with the Twins included two World Championships and one All-Star selection in a career that included 293 career home runs, a .282 batting average and 1,086 RBI. His uniform #14 is one of just four retired by the team. “We are pleased to partner with WFN to offer our customers this unique opportunity,” stated John Crowley, Vice President and General Manager for Charter’s Minnesota operations. “Charter is committed to building long-term, satisfying relationships with our customers by providing services they want. World Fishing Network offers content that adds value to our service, and responds to requests from our customers,” Crowley added. WFN: World Fishing Network is the only 24/7 television network dedicated to all segments of fishing with programming that covers instruction, tips, tournaments, travel, food, boating, outdoor lifestyle and more. WFN’s coverage includes a selection of the best international series and the most diverse species coverage of any outdoor network. Featuring popular programs hosted by the world’s top anglers, the network also includes a variety of exclusive lifestyle shows including Charlie Moore TV, Hookin’ Up with Mariko Izumi and WFN’s Reel Road Trip. Originally launched in December 2005, today WFN and WFN HD are available in more than 20 million households through North American cable, satellite and telecommunications distributors. In the U.S. , distributors include Verizon FiOS, Dish Network and Charter Communications. For more information visit www.WFN.TV. The Minnesota Twins played a one day series in Boston yesterday which included a day-night double-header. The Red Sox combined to score 17 runs in the two games while the Twins could only muster up four runs. I don't really have much to add besides the fact that the Twins just looked overmatched in every aspect of both games. But primarily when it came to the starting pitchers. Francisco Liriano really struggled with his control, throwing only 58% of the pitches he threw in for strikes. The good news is that out of the six strikeouts he recorded, five came at the hands at the best slider I've seen from Liriano since his surgery. The velocity still isn't consistently at 87 MPH, but he did touch it multiple times yesterday. While his slider looked great, his fastball did not. He threw 49 fastballs, but only 28 were strikes. That's a major problem. He missed a lot with his slider as well (13 of 22 for strikes) but he was trying to make the hitter fish for it quite a bit of the time. Having a reliable fastball has been something the Twins have focused a lot on, and when the pitcher doesn't have a good fastball going we most times than not see terrible results. That is what both Liriano and Scott Baker struggled with a lot yesterday, establishing a relaible fastball. Baker for the second straight start was setting pitches up on a tee for the Red Sox to clobber out of the yard. Baker gave up ten hits, three of which were home runs. The three home runs all came with a runner on base, and through two starts he has now given up seven home runs which is tied for the most in the Major Leagues. Six of the seven home runs Baker has given up have come off of a fastball that he just simply left up in the zone. His fastball has been his bread-and-butter pitch thus far in his career and obviously any player that relies on a fastball will have major problems if he cannot command it. And Baker is no different. It's not necessarily that Baker was missing the strike zone with his fastball, in fact 64% of the fastballs he has thrown this season have crossed the plate as a strike. The problem with Baker has been that it's that he is just not keeping the ball low in the strike zone, which has been the reason opponents are hitting Baker at a .375 clip and that seven of the 15 hits he has given up have left the yard. The fastball sets up all the other pitches you feature in your repertoire. When a player only has a fastball, it's bad. But when a player doesn't even have a fastball, which neither Liriano or Baker did yesterday, the results are almost always negative. Baker still doesn't look 100% and I wouldn't be surprised to see the Twins put him back on the D.L. to try and work on his mechanics in the minor leagues. He needs to pitch more, but the Twins really can't afford to have one of their most relied-upon starters trying to work on his mechanics while getting shelled every five days. I doubt they take this route, since there really isn't another option besides Anthony Swarzak in Triple-A that would really be worth a call-up at this point. It's too soon to push the panic button, by all means. But it is something that is going to have to change soon. The organization cannot allow Baker or the team continue to get beaten up this badly. Thankfully, the Twins have an off-day today to regroup after a bashing in Beantown yesterday. The Twins-Red Sox game was rained out last night in Boston, with there being a good chance that today's day-night double-header not being able to be played in its entirety as well. According to weather.com, there is rain in the forecast today, which could put a damper on the entire Boston series as Thursday also shows some rain as well. Hopefully, at least one game can be played today but it would be nice to have a day off after a double-header, which both teams do. Of course both could be played tomorrow, but neither club would prefer that. The Ft. Myers Miracle scored 16 runs last night behind a great start from Deolis Guerra. The 20-year-old right-hander went seven innings and gave up only two runs on 8 hits and two walks. He struck out four but kept the ball low in the zone and induced 12 ground ball outs which is what the Twins love to see. After a rough encore of the Florida State League in 2008, Guerra is off to a 2-0 start with an ERA of 2.77 through three games (2 starts). Another Miracle pitcher off to a hot start is Carlos Gutierez. The conversion from starter to reliever is still a work in progress, his ERA stands at 0.87 through 11 innings (two starts, one relief appearance). Philip Humber cleared waivers and will report to Triple-A Rochester. It was a risky gamble that could really pay off for Humber. Although his future with the Twins is likely as a reliever, he will likely start for the Red Wings to help a struggling rotation. However it would be nice to see Humber be used out of the bullpen (perhaps as closer) to get used to being called to work during the game in a high-pressure situation. Unfortunately, nobody really deserves a promotion from New Britain unless they look at relievers. Ryan Mullins and Zach Ward could be possibilities, but Mullins hasn't really been good either (despite what his 3.86 ERA may suggest) and Ward has also been used primarily as a reliever since making it to Double-A, but could probably make the switch. Perhaps they could make a Anthony Swarzak-like promotion with Jeff Manship and just hope that all he needs is a change of scenery. While not throwing 8 innings per start, Glen Perkins has been blogging. Yesterday, he gave us both a humorous post and one that will let us know what's to come. Finally, if you haven't done so yet, I suggest adding the new NBC Sports Blog "Circling the Bases" to your favorites. It has a MLB Trade Rumors-feel to it, only instead of rumors, the writing staff which includes Twins blogger Aaron Gleeman give updates as to what's going around in the Majors. It's a great read with many updates throughout the day. The Twins placed reliever Jesse Crain on the Disabled List today with inflammation in his right shoulder. The news is devastating to a Twins' bullpen which has already been absolutely atrocious this season, ranking 25th in the Major Leagues in ERA (7.03) while allowing opponents to hit just under .300 against them. Despite having a 7.50 ERA on the season, Crain has been the team's best relief option with exception to closer Joe Nathan. Prior to his last outing, when he gave up four runs in 2/3 of an inning to the Angels, Crain had a 1.59 ERA. With exception both of his first and last apperances, Crain threw the ball for a strike 77% of the time, whereas he threw it 50% in both his first and last appearances. Twins manager Ron Gardenhire has been longing for a reliever that can throw strikes and Crain was his best option. Unfortunately, he must have forgot what happened last year when he overused a reliever, which is the same case with Crain, he has just been overused. Crain threw 69 pitches over the span of four days through 3 1/3 innings pitched prior to being placed on the disabled list. Twins pitching coatch Rick Anderson doesn't believe it's serious, but obviously there will be concern over Crain's shoulder after undergoing rotator cuff/labrum surgery two years ago. Thankfully the Twins have bullpen options in the wings that can be called upon. After a strong 2008 season, the consensus after the season was that Mijares would be the Twins primary setup man heading into the 2009 season. After on-the-field issues following the season, the Twins coaching staff started changing their opinion on Mijares. And when he reported to camp overweight while pitching absolutely terrible, Mijares was cut from the Twins and was sent back to the minors. Mijares took the demotion with great stride and showed instant improvement in his pitching. He has thrown 50 of his 78 pitches on the season for strikes and has remained very efficient by averaging only 3.71 pitches per batter. Both of those areas were major concerns for Mijares in Spring. The Twins are hoping that they get the 2008-version of Mijares and not the version they saw in Spring Training. The Tampa Bay Rays took Tim Beckham with the first overall pick in the 2008 draft. He is a great athlete who could pay dividends to the Rays who took a risk taking him. He is great defensively and could make it to the Majors on that aspect alone. His bat needs work. He doesn't make a ton of contact but his bat speed, size, and way the ball comes off of his bat makes people believe he could be a legitimate 15-20 home run hitter in the major leagues. The Rays will have to be patient with Beckham, which they knew when they took the high school product less than a year ago. One of the reasons the Rays took Beckham was because of his willingness to sign, despite it taking $6.15 million to lure him away from a USC. On the flip side, they passed on Pedro Alvarez, who was considered to be the best player in the draft, but was a handful to sign. Alvarez plays third base, and we all know the Rays are ok at that position for the future, whereas shortstop is still wide open. When he reaches the Majors, Beckham should be a fixture in the Rays middle infield for a long time to come. Beckham is in Bowling Green this season and will likely be in the South Atlantic League all year long. He is joined with brother Jeremy Beckham in the middle of the Hot Rods infield. The Minnesota Twins completed their first sweep of an opponent since sweeping the White Sox at the end of September. The Twins outscored the Los Angeles Angels 23 to 12 while collecting double-digit hits in each game. The offensive surge was powered a lot on Jason Kubel's 8-14 series. Coming into the series, Kubel was hitting .226/.273/.355 through 21 at-bats. After Saturday's four-hit performance, Kubel's hitting line was up to .366/.395/.636 before dropping back down to .333/.362/.578 after going 0-4 on Sunday. He also doubled his RBI production on the season in those two games. Obviously all this really shows is that it's early in the season and a couple of games can really affect your statistics, but it does show the kind of series Kubel had. Kubel hit for the cycle on Friday, just the second Twins player to do so since Kirby Puckett did so nearly 23 years ago. The other player to do so was Carlos Gomez, who accomplished this feat against the Chicago White Sox in May of last year. Of course, the biggest highlight of the game was his dramatic go-ahead grand slam in the bottom of the eighth inning which eventually proved to clinch the game for the Twins, despite being down 9-4 when they came to bat in that inning. Kubel then followed up his four-hit performance on Friday with another four-hit performance on Saturday en route to a Twins 9-2 win. Kevin Slowey gave up only two runs over seven innings in his best start of the season. Both runs came off of a Torii Hunter home run in the second inning, which brings Slowey's season total up to five home runs surrendered, tied for second most in baseball. On Sunday, the offense was cooled by a ground ball pitcher named Shane Loux. Loux induced 12 ground ball outs in the game, the fourth time this season an opposing pitcher has induced double-digit ground ball outs against the Twins. Loux 'quieted' the Twins to just three runs but Twins starter Glen Perkins did him one better (or two better) and held the Angels to only one run in his second victory of the season. Perkins is now 1-1 despite giving up only four runs on the season while hurling eight innings in each of his starts. Perkins has made all three of his starts at home in the Metrodome but is scheduled to make his next start on the road against the Cleveland Indians next Sunday. Offensively, Jose Morales picked up his first RBI of his career while going 2-3 with a double. Gomez went 3-3 with an RBI. All three of Gomez's hits were hit inside the infield. He also was called out while trying to steal second base, which replay showed was probably the wrong call. The Twins will now have their first off-day of the season before heading to Boston to face the Red Sox on Tuesday and Wednesday. The Twins were swept in Boston last year and the last time the two teams faced eachother, the Red Sox clobbered the Twins 18-5. The Twins will face knuckle ball thrower Tim Wakefield on Tuesday while countering with Scott Baker. Wakefield is has a 13-5 record with an ERA of 4.31, BAA of .249, WHIP of 1.28 and a K/BB ratio of 2.11 against the Twins, which are very similar to his career numbers at Fenway. In his last start, Wakefield no-hit the Athletics through seven innings before throwing a complete game victory while surrendering two runs. On Wednesday, the Red Sox will send Brad Penny to the hill while Francisco Liriano will get the start for the Twins. Penny is 0-0 with an ERA of 7.50 in one start against the Twins. Liriano has never faced the Red Sox which should make for an interesting game for both teams. The Twins found their stroke at the plate while the pitching was excellent this weekend, hopefully it carries over against the always-tough Boston Red Sox. Don't really have a recap as I'm sure everyone already knows what happened last night... (Go figure; something good happens and I have nothing to say). One thing though, I guess I don't understand how Kubel's cycle/grand slam fails to be a more deserving ESPN "Top Play" (which ranked Kubel's blast at 8) than a diving stop from David Wright (which didn't decide the game) and a throwout at third base by Hunter Pence (which again, did not decide the game). Don't get me wrong, both were outstanding plays, it just bothers me when I know that if it had been Derek Jeter (or any media baby) hitting the cycle/grand slam it would have been number one. Where's the love? I'm not saying it should have been number one, but certainly higher than eighth. (And I know I'm preaching to the choir on this issue, but it still irks me). In an attempt to cure an already terrible bullpen, the Twins cut probably their weakest link today when they decided to designate right-hander Philip Humber for assignment. If Humber clears waivers, he will head to Triple-A Rochester where he spent the 2008 season. Humber, a product of the Johan Santana trade, struggled through the first half of the 2008 season with the Red Wings before finally finding his form in the second half. All tole, he finished the 2008 season with a 10-8 record and 4.56 ERA. He made a good impression after being recalled last September, but was still far away from being the pitcher the Twins thought they acquired. He struggled in Spring Training but his roster spot was assured due to the fact he'd almost certainly be claimed off of waivers should the Twins decide not to bring him North to Minnesota. Unfortunately, he never figured things out in Minnesota either and was drilled hard in two of his four appearances out of the bullpen. Most importantly, the Twins have been looking for their relievers to just throw strikes, which is something Humber has had problems doing. Humber only threw 60 of his 108 pitches (56%) for strikes this season. He gave up six runs in only 4 1/3 innings pitched (12.46 ERA) and had a terrible 3.23 WHIP. Humber just wasn't getting people out and was very hittable, surrendering a .478 average to his opponents. As bad as he has been, it would still be nice to see if he can clear waivers and report to Rochester. To fill his spot on the roster, the Twins claimed right-handed reliever Juan Morillo from the Colorado Rockies. Morillo is a 25-year-old right-hander from the Dominican Republic. He has pitched in the Rockies organization since signing as a non-drafted free agent in 2001, finally making it to the Major Leagues in 2006. He has thrown 8 2/3 innings at the major league level, giving up 11 runs (11.42 ERA). The most notable thing with Morillo is how hard he throws. He could give the Twins the kind of impact that Joel Zumaya of the Tigers gives Detroit, but only Zumaya has slightly better control which should give you incite to the kind of "pitcher" Morillo is. He has reached 100 mph with his fastball but his control is about the same as an infant's bladder. He also throws a hard slider and change-up, but those both are not reliable pitches and he generally relies on his fastball. The Twins had two "inning-eaters" in Humber and R.A. Dickey and thought that one was expendable. Of course I would generally agree with this decision, however the bullpen has already thrown 34 innings this season, and five times the starters have failed to reach six innings in a start. I understand that having two inning eaters can be unnecessary, I still would have liked to see the Twins hang onto two pitchers that can throw more than two innings for the time being. Thankfully they are still hanging onto seven relievers and most can be called on for two innings if needed. But then we run the risk of over using some of our relievers, and we all know what happens in that circumstance. Regardless, I'm happy the Twins are taking a gamble and recognizing that something has to be done. Hopefully it pays off. Much like yesterday's post, this one will (for the most part) have a negative tone to it. We're still under two weeks into the season, and already I've grown sick and tired of the hot/cold (but mostly cold) offense coupled with the horrendous bullpen. Last night, the Twins were clobbered again losing 9-2 to the Blue Jays while falling to 4-7 on the season. The Twins received a solid start from southpaw Francisco Liriano. He gave the team a chance to win which is something most of the Twins starters haven't done up to this point. He gave up two runs (one earned) on seven hits through the six innings that he was on the hill. Despite surrendering only one walk while striking out five, Liriano still had a hard time finding the strike zone and when he did, he left the ball out over the middle of the plate which negatively reflected his ground ball to fly-out ratio. But thankfully, he kept the ball in the park unlike Scott Baker last night. Back when he was "on top of his game" or prior to his surgery, Liriano had a great 2.37 GB/FB ratio. This season, he has a 0.86 GB/FB ratio. Obviously we can all scream "SMALL SAMPLE SIZE!" however, each game these ratios have gotten worse and worse. To compare, on Opening Day he induced 12 ground balls while only inducing 2 last night. Thankfully, last night yielded his best results of the season and left a lot of encouraging thoughts . He now sits at 0-3 with a 5.09 ERA and a 1.25 WHIP. Last nights start was his most encouraging of the season, but like Baker, he will have his work cut out for him in his next two starts. Both are slatted to start against the Red Sox and Rays in their next two starts. And unfortunately for Liriano, both teams are hitting left-handed pitching a lot better than right-handed pitching so far this season. The Twins starters are now a combined 2-6 with a 5.40 ERA. Last year after 11 starts, the team sat at 6-5 while the starters were a combined for a 6-4 record and a 3.22 ERA. Hopefully the Twins starters can start figuring things out. Thankfully the next four opponents they're set to face all have sub-.500 win percentages right now, and like the Twins all figure to be significantly better than what their current record suggests. You may think this entire post is verbose and completely redundant, and you may have a point. Pitching better really means nothing if your offense cannot score runs. That is one thing (of two) that is currently frightening me more than our starting pitching. The bullpen... uhh...well... that's another story all together. Uff da! The Twins received their worse defeat of the season last night, falling to the Blue Jays 12-2. The ten run difference was the widest margin of defeat since September 19, 2008 when the Twins loss to the Tampa Bay Rays 11-1. This loss came at the expense of Scott Baker's return being overshadowed with poor command and lack of velocity, in other words, not the Scott Baker we've come used to over the last couple of seasons. Baker's velocity (or lack there of) was an issue early on in the game but fortunately it picked up some steam and by the end of his appearance, he was throwing around 92 mph, about five miles per hour faster than he was when the game started. Unfortunately his command did not make the same turn around, he continuously left the ball up in the zone to most of their hitters and as a result was clobbered for four home runs. This was Baker's first start of the season after landing on the disabled list in Spring Training with a 'stiff shoulder.' He made one rehab start in Fort Myers, throwing seven innings and giving up only one run on five hits. Although in both games Baker was pounding the strike zone, in last nights game, he induced only four ground balls opposed to the 11 he induced while on his rehab start last week. As a result of Baker coming off of the D.L., Brian Duensing got sent down to Triple-A Rochester where he'll likely be most of the year, barring another call-up. Baker's next scheduled start is next Tuesday against the high-powered Red Sox offense. Hopefully his next start is better than this one, unfortunately it won't come any easier as he's scheduled to face the Tampa Bay Rays after the Red Sox. He'll definitely have his work cut out for him in the next couple of weeks. Even if Baker did pitch great, he wouldn't have gotten much help from the offense which only mustered up two runs on four hits. The two runs came in the first inning, which Baker quickly gave back with a two-run home run in the top of the second inning. It was just all down hill from there. The offense was non-existent after the first inning and the pitching was pretty horrendous even after Baker exited the game. Rookie Philip Humber gave up two runs in just under two innings before R.A. Dickey came in and allowed an inherited runner to score before he could get out of the sixth inning. Dickey threw two and a third innings giving up just one earned run before handing the ball to Luis Ayala who continued his rough start to the season giving up one run in his only inning of work. All around, it was a game the Twins would like to forget. Unfortunately they face the surging Blue Jays one more time tonight, but on the bright side, after tonight, the Twins will have a five month brake from the Blue Jays. • Yesterday's game against the Toronto Blue Jays was great in the first inning before everything came apart in the second inning. The Twins celebrated "Jackie Robinson Day" by giving up 12 runs to the Blue Jays. As John Mayer of TwinsMVP.com puts it, "Scott Baker was throwing batting practice." • The Twins Single-A affiliate the Beloit Snappers, fell victim to a no-hitter yesterday. The Quad Cities River Bandits (Class A affiliate of the St. Louis Cardinals) used two pitchers to combine for seven no-hit innings. The game only went seven innings as it was the first game of a double-header. They lost the second game as well, but at least they collected four hits. • For more Minor League information, make sure to head over to Seth Speaks where Seth Stohs gives us a Minor League Report where he took a look at how each organizational team did yesterday and gave his thoughts on several minor league players and topics. • And speaking of Seth Stohs, whom I doubt ever sleeps, make sure to check out his newest post at the Star-Tribune's Your Voice page. He appropriately wonders why this region is more-so considered "Vikings Territory" instead of "Twins Territory." Obviously football has surpassed baseball in popularity, but the success of the Twins in recent years (and in history) and lack of success by the Vikings (and in their history) makes me wonder why more people aren't supporting the Twins compared to the Vikings as well. • Seth Stohs also hosted last night's podcast at MNGameNight.com. He had Over The Baggy's (and Baseball Digest's) Parker Hageman and The Twins Geek John Bonnes on as guests. • Twins catcher Joe Mauer who has been on the D.L. all season while not playing in a single Spring Training game will begin a rehab assignment next week. He has ran this week without any complications from an inflamed sacroiliac joint in his back. The Twins are expecting Mauer back sometime before the end of the month. • Aaron Gleeman hopes that Manager Ron Gardenhire will start using less of Luis Ayala and more of Craig Breslow and Joe Nathan. I agree completely. Ayala has been atrocious this season, and I've wondered how he's already racked up six innings of work (leading all of our relievers not counting R.A. Dickey who has started a game) when he has pitched this badly. • Parker Hageman from Over The Baggy took an in depth look at Carlos Gomez's batting tendencies and concludes that he should be more aggressive at the plate, instead of taking pitches which is what many want him to do. • If you haven't checked out Dugout Splinters, make sure to do so today! The site gives you a deeper look at the upcoming pitching match-ups in a series. • Twins infield prospect Trevor Plouffe wrote on his blog Plouffe! about getting acclimated to a new city and shared with us his love for finding good food. Definitely check it out! • Twins reliever Pat Neshek shows us a note he received from Harry Kalas from 2006. Kalas, 73, has been an announcer for the Philadelphia Phillies for 38 years and was inducted into the Hall of Fame in 2002. He collapsed in the broadcast booth on Monday prior to the Phillies-Nationals game and passed away upon arrival at a local hospital. • Judd Spicer of CityPages.com takes a look at the Twins starting rotation and their performances this year while drawing comparisons to characters from the movie "Young Guns." • Thrylos from The tenth inning stretch looks at The Curious Case of Kevin Slowey. His prediction that Slowey should rebound soon could be become a reality if the "mechanical flaw" Slowey found in his delivery during a film session on Wednesday is fixed. • Ben Lindbergh from Baseball Prospectus looks at the "Replacement-Level Killers" and concludes that the Twins season could hinder on Michael Cuddyer's shoulders. Coming into Tuesday, the Twins were 0 for their last 10 against the Toronto Blue Jays which dates back to July 23, 2007. The Twins have been outscored 30-69 in that same time period. In fact, the last time the Twins beat the Blue Jays, Carlos Silva served up a meatball to Frank Thomas who had hit his 500th career home run at the Metrodome on June 28th, 2007. But all that changed last night. Glen Perkins gave the Twins eight strong innings, the second time this season (in two starts) in which he's thrown eight innings. He allowed only two runs on seven hits while walking one and striking out four. Perkins on the year now has a 1.69 ERA through two starts, by far the lowest ERA amongst any Twins starter. Joe Nathan threw the ninth inning before handing the ball over to Jesse Crain who pitched both the 10th and 11th inning, eventually being crowned the winning pitcher. Crain had an epic 12 pitch battle with outfielder Adam Lind, which ultimately resulted in a strikeout. Crain was working his fastball between 93-95 MPH with 74% of them crossing the plate as strikes (14 of 19 fastballs thrown). The Twins didn't quite rack up 13 hits like they did the night before, but they did collect double digit hits for the third time this season. The team has a total of 77 hits on the season, 23 of which have come in just the last two games. The Twins had three players with two hits in the game, regular contributors Denard Span and Justin Morneau as well as newcomer Joe Crede all combined for seven of the Twins ten hits. Both Morneau and Crede drove in runs, although Crede's is the one people will remember as it came in the bottom of the 11th inning which proved to be the winning run. Crede drove in Morneau from first base with a double to give the Twins their first victory against the Blue Jays and snapped a potential four-game skid that the Twins don't want to have this early in the season. Prior to the contest, the Blue Jays only had one batter (Rod Barajas) not hitting above .300. The Twins on the other hand only had two who were hitting above .300 (Span and Nick Punto). In fact, the Twins had four batters hitting belowe the Mendoza line prior to the game. Scott Baker will come off of the disabled list to make his first start of the season against Scott Richmond of the Blue Jays tonight at the Metrodome. The roster move will likely send Brian Duensing to Triple-A Rochester while the Twins likely hang onto long-reliever R.A. Dickey for now. The start will be Richmond's first against the Twins while this will be Baker's third start of his career. Baker is 0-1 with a 3.72 ERA against the Blue Jays in 19 1/3 innings pitched. Denard Span is not showing any signs of a sophomore slump. lthough it's still early, if this season has taught us anything it is to not put too much stock into Spring Training results. At least in the case of Denard Span. His poor results in Spring Training made his critics look right up until the first game of the season. Span had a phenomenal rookie season in 2008. He took on the role of table setter for the Twins, providing an .819 OPS which was .110 points higher than his career Minor League OPS. And he did so at an important time. While Michael Cuddyer was injured and Carlos Gomez was struggling at leadoff, Span stepped up in right field to give the Twins both a reliable hitter as well as a reliable defender. Still after all of that, some believed Span had something to prove in Spring Training. He ended up leading the team in at bats, but hit below the Mendoza Line while struggling to get on base, which is crucial for any leadoff hitter. Span entered the season as one of five Twins outfielders vying for playing time in four spots in the lineup (including DH). Unfortunately for Span, the other outfield options looked impressive in Spring Training which brought up the question whether or not Span is worth a starting spot in the lineup. Span's minor league track record showed that he was a light-hitting, speedy outfielder with poor plate discipline with good defense and was likely a Major League fourth outfielder. While the defense has remained impecable, through 376 at bats, Span has proved that he should be at the top of the lineup nearly everyday. Span is a menace for opposing hitters. He takes pitches, draws walks and has good pitch recognition. He's certainly making manager Ron Gardenhire look good for the high amount of faith he showed in Span since he came to the Twins a year ago. A week into the season doesn't make Span a fixture for the future by any means, but it's hard to imagine him not succeeding with the way he has played since he first reached the Majors.